Yes another Ash Gaming developed video slot machine for Playtech. Read our review of this new online slots game and play it today at an online casino with a free spins bonus. We give you all the detail on how to play slots and where to get the biggest, best casino bonus. Nostradamus was a famous french apothecary from the 16th Century. He has many visions and prophecies of future events and predicted many world events and disasters. 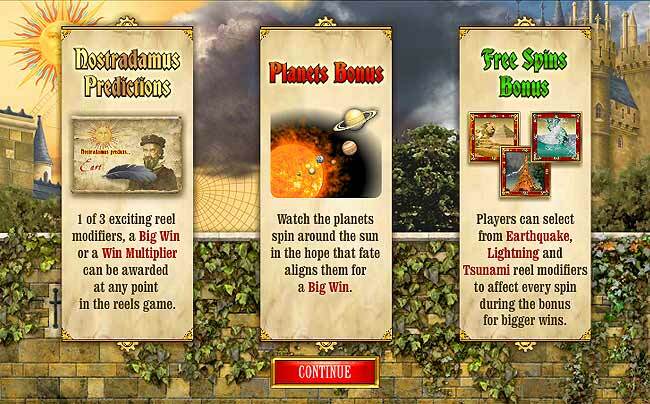 This game covers stories of earthquakes, tsunamis and lightning strikes in the FREE SPINS bonus game. The game has no fixed paylines, it operates on 5 reels with wins paid for matching symbols on adjacent reels from left to right. The game also offers a few nice bonus features to help you win bigger cash prizes. The symbols and gameplay is pretty standard. The first feature is the Nostradamus Predictions. This may be an earthquake that will shake and rattle the reels knocking non-winning symbols away to be replaced by others. 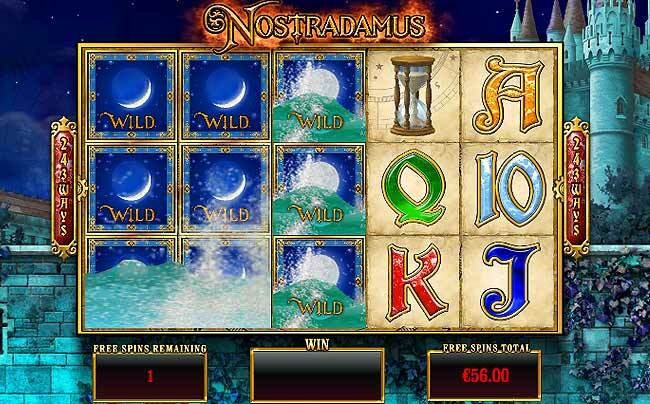 The reels also give WILD, FREE SPINS and BONUS symbols. Three FREE SPINS symbols will start the free games, you are awarded 5 free games with three symbols, 10 free games with 4 symbols or 15 free games with 5 symbols. You can choose 1, 2 or 3 reel modifiers depending on the amount of spins you have. Modifiers will give random wilds, stacked wilds or earthquake aftershock collapsing reels. If you only get to choose one modifier I would go with the Tsunami Wild Reels, this can give 3 wild reels and getting these on reels 1, 2 and 3 will give a huge mega win. The main feature of this slots game is the PLANETS BONUS. Spin the bonus symbol on reels 1, 3 and 5 to start the game. With this game you see the planets spinning around the sun. If a planet stops on the win line you will win that multiplier. You can align all six planets and get a big jackpot win. Make your Nostradamus prediction and start playing the game today. This is a fun game with the potential for big cash payouts. Click the "PLAY NOW" button below to play for real with a huge free spins and cash match welcome bonus.